1. Please introduce yourself. Who are you? How old are you? Where were you born? Etc. Give the readers some background about yourself. Tina “Sweet Tee”. Robinson, Master’s Division competitor, Born in Brooklyn NY, grew up near Wilmington NC. I’m thinking about continuing my education and pursuing my PhD but it’s been a thought since completion of my MBA in 2004? I love life and live it to the fullest! 3. What are your hobbies (other than powerlifting)? My hobbies include traveling, reading, eating, & sleeping. I love to sight-see (explore different countries and states) as well as people watch! 4. What is something that most people don’t know about you? That I’m somewhat shy/bashful and I grew up hating my ‘freckles’ due to a complex that my sister gave me. 5. What is your occupation? I am an USAF First Sergeant! My job is People and everyone is my business. I dedicate my time and energy to their needs, their health, morale, discipline, and welfare. I grow in strength by strengthening my people. My job is done in faith, my people build my faith! 6. Does it interfere with competing or visa versa? At times, when I’m preparing for my AF Fitness Assessment which consists of running 1 mile & ½, pushups, sit-ups, & abdominal circumference. Sometimes my on call 24 hrs/7 days a week status does as well but I LOVE being a First Sergeant!! 7. How did you get into powerlifting and how many years have you been competing? While stationed at Keesler AFB MS, one of the guys (Stevie Swanigan) I would work out with quite often at the time convinced me to Powerlift, to go and compete and I’ve been doing so since approx. 2001. 8. What are your biggest squat, bench press, deadlift and total numbers? My squat PR is 350, bench 315, deadlift 375. 9. What titles, records and achievements have you accumulated during your powerlifting career? 10. Can you describe your training philosophy and/or a typical training session? I’ve never been a serious lifter so a typical training session is like a ‘social hour’ for me. I’m always talking to different people and having a good time! 11. Do you compete equipped (squat suit, bench press shirt & deadlift suit) or unequipped (no suits) or both and what weight class(s) and divisions(s) do you compete in? I’ve always been a Raw lifter/unequipped, 198 weight class, Military, Masters, & Open divisions. 12. What is your favorite lift, squat or bench press or deadlift or all three and why? I would have to say that my bench press is my favorite because my squat and deadlift have always seemed to be a work in progress, always working on my technique and for some reason don’t seem to do them enough, neglect on my part. 13. Who is the most impressive lifter you have competed against? They’ve all been impressive to me and motivational! 14. Who do you think is the greatest lifter of all time? I would have to say Mr Gene Bell, I don’t follow Powerlifting as sad as that is to say? 15. When was your last competition & how did it go? 2012 Raw Powerlifting Nationals, Killeen TX (August) and I did fairly well, not as well as I would have liked to of course but I suffered an injury that caused a setback prior to the meet. I was trying to do some things (clean & jerk) that would help increase my deadlifts but evidently didn’t do them correctly. I also competed in the 2012 Military Powerlifting Nationals, in Kaiserslautern Germany, (March), won best female lifter award and a tons of BSN products/supplements, along with a weight set that was donated to the Kaiserslautern High School gym. 19. How many competitions do you compete in each year? Normally 1 to 2 but this year will be 3. 20. Who is your greatest competitor/rival and why? N/A I’m always competing against myself, trying to get a PR. 21. What advice & tips would you give to a powerlifter that is just beginning? If you are just beginning, what advice have you received from other lifters or coaches? My advice is to make sure you have someone that can help you with your technique so that you don’t get hurt/injured. 22. How has powerlifting changed your life? Powerlifting has changed my life in so many aspects, from building confidence to affording me more opportunities to travel and meet more people as well as the ability to encourage, motivate, & inspire others in so many aspects of their own lives. After winning the title of the ‘Strongest Female in the Area of Responsibility’ in 2009, while at a deployed location, one of 2 pictures used in a base newspaper article was spotted on line by a Colonel/Professor at the US Air Force Academy, she has used the picture on the cover of a text book that she wrote and published for use by the Cadets at the Academy. The other picture has also been used on various other items such as posters, AF Safety training sites, Veteran Administration pamphlets, and AF Fitness Center bulletin boards. 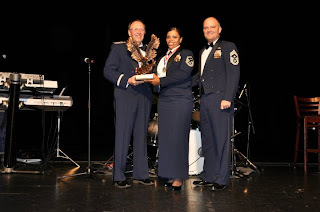 I also won the title of “2011 AFRC Athlete of the Year”. So I would have to say Powerlifting has changed my life in the Notoriety aspect for sure. 24. What is your #1 or most prestigious meet you ever competed at in your career? I think it will be when I compete on the USA World Raw Powerlifting Team in Russia, June 2013 and at the Arnold Classic in Ohio, March 2013. Also being a member of the Air Force Powerlifting Team, what an honor and a privilege! 26. 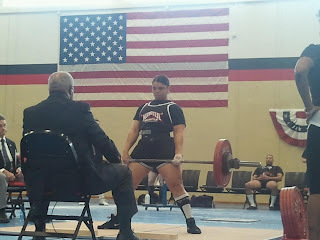 What is your favorite memory from any powerlifting competition or event? I would have to say meeting Bill Kazmaier (World’s Strongest Man/Commentator) at a Military National Powerlifting meet in Little Rock AFB AR, 2004, he gave me some tips that helped my deadlift that day, autographed my Powerlifting belt, and he carried my gym bag around like he was my bag boy! I got a chance to see him again in 2006 when he came to the base where I was stationed at the time, Keesler AFB MS where he bent a frying pan in front of my Military Tech School students and autographed it for me. 29. Anyone you would like thank for helping you along the way in your Powerlifting career? There’s so many people that I can’t name them all, they know who they are all around the World! ;-) Not just for the Powerlifting tips or spots in the gym, but I want to thank them for believing in me when I didn’t believe in myself. For pushing me when I would whimp out or think that I couldn’t push the weight. For those that have been my ‘Cheerleaders’! For the inspiring, motivating, & encouraging words/expressions, it meant more than they’ll ever know. I know I sound like I just won a ‘World’ title or the Olympics but who knows what the future holds…maybe I’ll get serious my last few years Powerlifting and do just that? But this was one of the ‘platforms’ that I was offered and I’m Thankful!